Oh My Glob. I don’t remember who gave me the best present ever. I don’t even remember if the best present ever was actually a present for a special occasion or just something to make me go outside. Roller skates. I loved my roller skates. I didn’t really like the color. White with red and blue stripes. So no pink skates to match my Pink Panther bike. Most of the kids in that neighborhood were boys, who did not like pink. The one other girl that was around was not into pink either. Anyway, no one ever stole my skates (that were not pink) or my bike (that was the pinkest of the pink). There were not many options back then. Ebay and Amazon did not exist in the 80s. Mail-order things were probably limited in the skate department. I really don’t remember. I wasn’t allowed to order things. I was an adolescent without a credit card but I lived through it. I was just happy to have some skates. I think that I was about ten when the skates appeared in my life. Where are they now? My guess is that they are probably in Michigan at my grandparent’s cottage right where I left them about 20 or more years ago. P.S. Look at this photo and all of it’s awesomeness. You’re welcome. 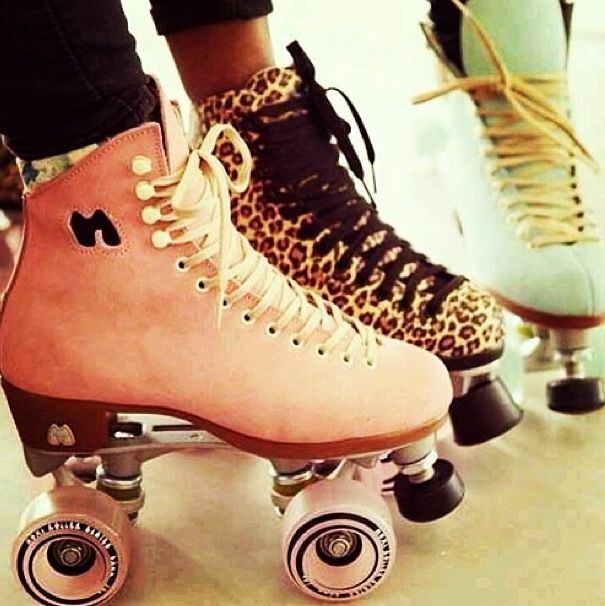 I used to love going roller skating and love the new look to skates shown with leopard print. Lol!